Ryan and Jess Solberg were married on July 6, 2013 and the heat was absolutely not lacking! As all their family and friends gathered around to witness these two exchange their marriage vows; you could see all the love they had for one another! Congratulations Mr. & Mrs. Solberg and may God continue to watch over you both and continue to Bless your marriage! Thanks for choosing Erickson Productions to capture your wedding day! The marriage ceremony of Travis & Alicia Gunwall took place in Regent, ND at the Enchanted Castle on July 20, 2013! Congratulations to you both; you are such fun couple and I enjoyed capturing these memories for you as well as taking part in your reception! Thanks for choosing Erickson Productions and may God bless you and your Marriage!!! The marriage ceremony of Travis & Alicia Gunwall took place in Regent, ND at the Enchanted Castle on July 20, 2013! Congratulations to you both; you are such fun couple and I enjoyed capturing these memories for you as well as taking part in your reception! 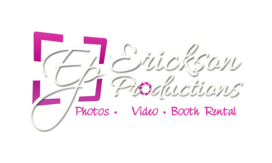 Thanks for choosing Erickson Productions and may God bless you and your Marriage!!! Jeff and Danita Harris were married on July 27, 2014 and had a beautiful summer wedding day. They tied the knot in the Ridgeway Lutheran Church as their family and friends gathered around to witness. Seeing the passion and love they have for one another was a joy to shoot! Congrats Danita and Jeff and thanks for choosing Erickson Productions to capture your wedding day. Travis & Melissa Pfennig were married in the "Heart of North Dakota" - McClusky, ND. I teamed up with my hubby for this wedding to capture their special day with Photos and Video. We had so much fun with everyone and it was such a WONDERFUL day to spend with Travis and Melissa as they pledged their vows to one another. My hubby did a great job on the video camera and we put together this highlight for our good friend and his new wife! Congratulations Travis and Melissa!!!! We had so much fun with everyone and it was such a WONDERFUL day to spend with Travis and Melissa as they pledged their vows to one another. My hubby did a great job on the video camera and we put together this highlight for our good friend and his new wife! Congratulations Travis and Melissa!!! Travis & Melissa Pfennig were married in the "Heart of North Dakota"
great photos prior to the ceremony of the bride and groom individually. Travis & Melissa; we wish you all the best in your married life. choosing to have me capture this special day. was so fun to watch Matt look at his new bride as she came down the aisle. his breath away as he would look her up and down and hold her hand. for being my very first Williston Wedding! Dickinson, ND. Olya has a radiant smile that lights up everyone she is around. day for them! I had such a wonderful time with them and their wedding party. strengthen your Marriage each and every day! Jenell and Brandon, may God continue to Bless you in your future! day! Congratulations Clint & Nicole and may God bless your marriage and future! the best and hope to work with you again in the future! getting caught up, that meant the world to me! and a gorgeous couple. Congratulations Les & Amanda. is good for all of us married couples to remember and be reminded of. another and I look forward to seeing their love grow in the years ahead. fun and such nice people, thank you. and it was a fun time! Thank you Dale & Elena for a wonderful experience. shoot a wedding in my hometown! Congratulatiosn Mr. and Mrs. Kevin Bock.